The Pro Tools Production I (PT201) course covers the core concepts and skills needed to operate an Avid Pro Tools HD 12 system in a professional studio environment. 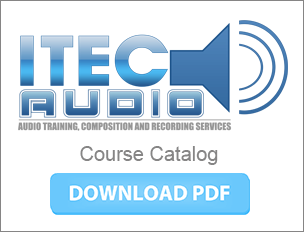 This course builds on the Pro Tools Fundamentals I and II series of courses, providing intermediate and advanced-level Pro Tools concepts and techniques. Students learn to customize the configuration of Pro Tools|HD Native systems to maximize results and improve recording, editing, and mixing workflows. The hands-on exercises provide experience optimizing system resources, configuring I/O, navigating and color-coding sessions, managing session media, using advanced selection and auditioning techniques, working with clip gain, applying advanced automation techniques, creating submixes and applying parallel processing, advanced mixing and finishing techniques for a final mixdown. This course provides the foundational training for the Avid Certified Operator: Pro Tools HD | Music and Avid Certified Operator: Pro Tools HD | Post certification exams.